Bibliotech: What is THE ANNEX@? We started this post a year ago and never published it. 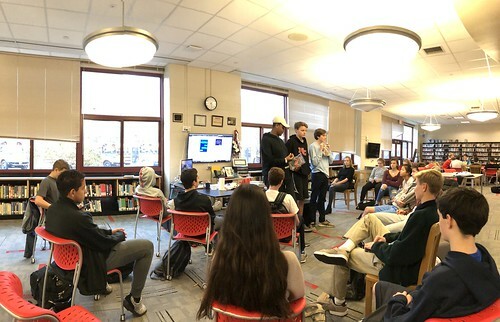 While most students quickly learn about THE ANNEX@ upon entering New Canaan High School, it occurs to us that members of our greater learning community ("greater" meaning larger, not better) do not necessarily know what it is. Yet, it is probably one of our virtual library's greatest ("greater" meaning both bigger AND better) assets. THE ANNEX@ is our learning portal. When we meet with classes, our lessons include a walk-through of the instructional materials assembled/created for that specific research task, all of which are curated in THE ANNEX@. Until Tuesday, most lessons were organized into a "playlist" (we use LessonPaths to create our playlists). When students needed a refresher on what we covered in class, they could navigate through the steps to locate the one they wanted to review. We liked this software as a learning tool because it helped students find exactly what they needed without having to dig through a long narrative. The screenshot below features a playlist (green box at the top) as compared to an older post (a long passage of text with a few embedded images). Until this week, lesson playlists were posted to a simple blog. We used Blogger because it is part of the Google for Education Suite. It is easy to access. Sign in is not required, so students, teachers, instructional aides, parents, members of the New Canaan community and folks beyond could access what we teach. We deeply value that transparency and universal access. Posting to LessonPaths was great for students, but clunky for us. We had to rely on third party software to convert our own images to links before embedding them, and it did not integrate seamlessly with materials we published in Google Suite for Education. We were having further trouble with LessonPaths because it tends to crash regularly. Finally, and this was really what pushed us to make a radical change, Blogger included ad content to THE ANNEX@ sidebars. We had no control over the posted ad content and we decided that we need to rethink our packaging. So this week, we switched THE ANNEX@ button on our navigation menu (see below) to a new destination. Back in 2008, our first iteration of THE ANNEX@ was in Moodle, an open-source learning management system. Seeking a more transparent platform, we switched to Blogger in 2011. This time we are moving our content to LibGuides (by Springshare). In LibGuides, we preserve the transparency we wanted from Blogger. While the user experience is a little different than in LessonPaths, we still have the capacity to scaffold steps in our research guidance using tabs. Here's the thing: we are starting fresh. It will take us some time to populate our new THE ANNEX@ as thoroughly as our old one. It will happen one project at a time over the course of one year. Each year, we enhance what is there, so after 5-7 years, it is pretty robust. Year one on the other hand, is a little sparse. Please be patient with us! It is important for members of our learning community to let us know if something is missing. We can be emailed at contact@nchslibrary.info or texted at (615) 669-6670. 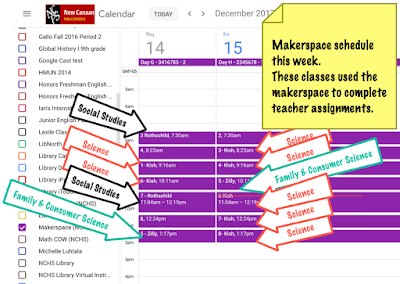 We also wanted to share that the makerspace is being used across disciplines and grade levels for classroom projects. Below, you will find a screenshot of the makerspace schedule from December 14 and 15. During these two days alone, over 200 students collaborated with classmates on assignments for class. Several students chose to come back during "free periods" to continue their work. In science, students collaborated to design and create a product for the NCHS Mineral Marketplace. As a culminating experience, ninth grade Earth Science students will have to "pitch" their creation to customers visiting the Mineral Marketplace. After conducting a designer study in Fashion Design, students came to the makerspace to design a household item that reflected the designer's style. For Global History, students created 3D, 2D, and/or digital plans that outlined a military strategy proposal to address the clash between Sparta and Athens.